Initially, I had no idea where this place was. It was nowhere to be seen in the vicinity of the village of Andraz, but helpful locals there pointed me five kilometres north. 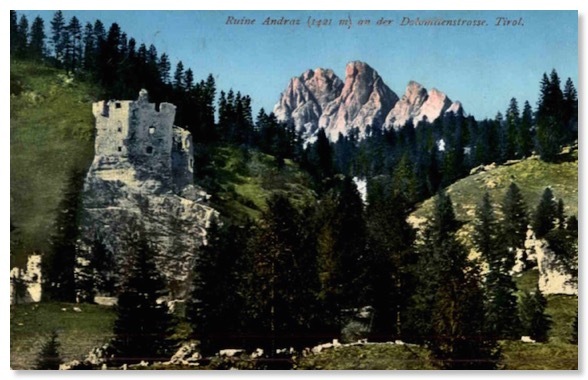 The ruin (also known locally as “Castel (or Schloss) Buchenstein”) was visible occasionally through the trees, from the Great Dolomite Road, in what was once probably a very dominating position where the valley narrows. Much of the north side of the ruin was behind scaffolding (September 2011). A 100,000 euro project began in 2010 to restore and roof parts of the building. However, it rather looked like work had come to a halt. Access was prohibited by a locked gate. 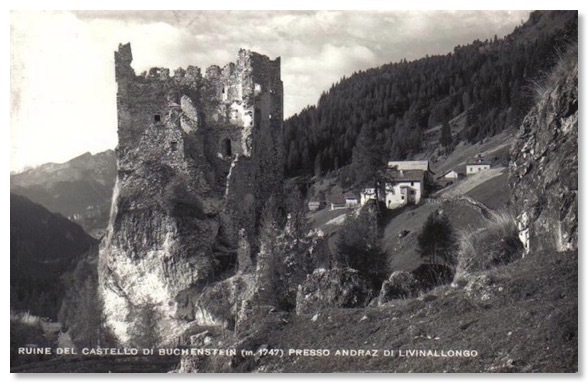 The Zardini photo, used in both guides to the Road, had clearly been taken from the east. Half an hour stumbling through the boulder and grass meadows downslope of the eastern side of the Castello confirmed this was too low a viewpoint, and that the shot had been taken from high ground the other side of a stream. That was ground now totally overgrown with conifers, and all but inaccessible. I backtracked and found an old path into these woods, but no amount of energetic bush-bashing through thick conifer growth could get me any view of the ruin. 100 years of tree growth has concealed the Zardini viewpoint for ever. It was probably the most energy I have expended on this project for no result! 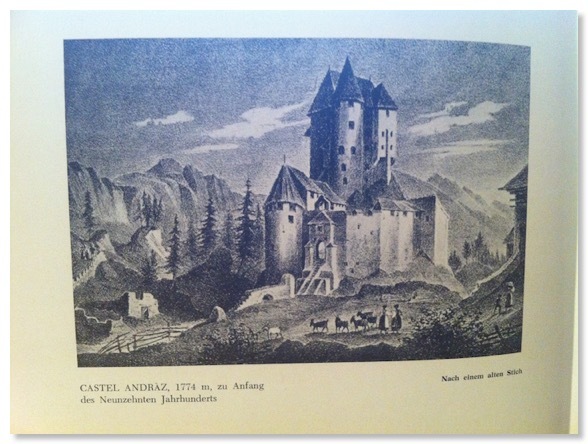 The area around the castle was used as an Italian base in the WW1 fighting, probably as a field hospital. It is about 5 km behind the Falzarego/Lana front line. A large enclosure of war graves is very obvious in the Zardini photo, dating this at perhaps about 1918-20. There is no sign at all of these graves now. The position of the cemetery was easily established from the original photo, showing it next to a huge boulder, which is still very much in evidence on the ground. 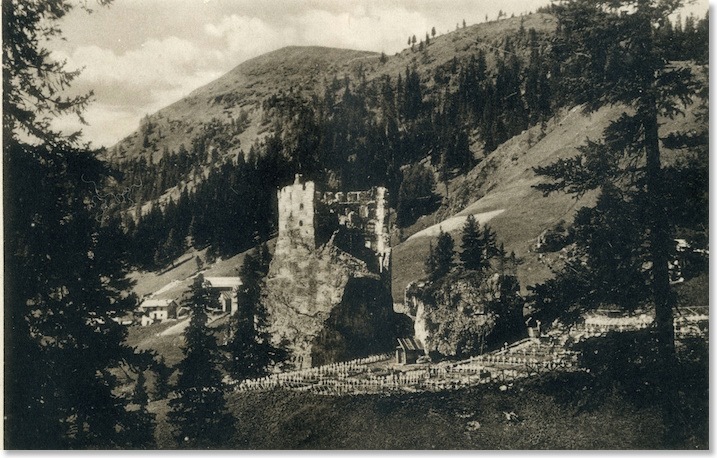 The graves will have been consolidated in a valley cemetery, or the Pocol ossuary above Cortina, in the 1920s, no doubt. 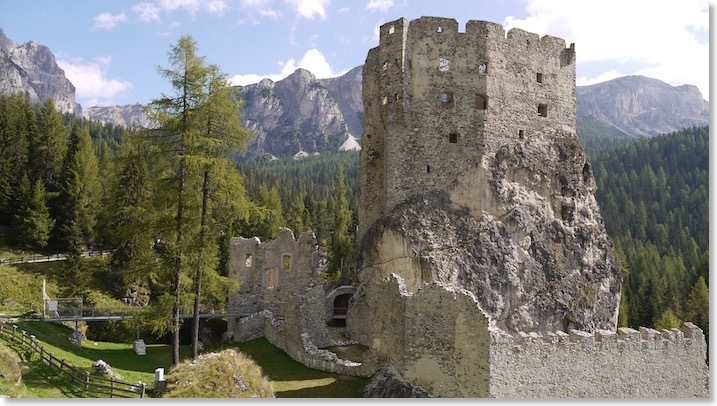 The information board beside the Castello says little about the building’s role in WW1, other than to suggest it was basically a ruin by then, in any event, just that it suffered further "looting and bombing". There is no evidence of typical WW1 fortification in the immediate area or in other local old buildings. It is, however, interesting to speculate that other buildings in this area were constructed very soon indeed after WW1. The photo I took of the ruin thus gives just a general impression of this spot as it was in 2011. The opportunity for a proper comparison shot has been lost in the woods.